The visa of Brazilian Jean Charles de Menezes expired two years before he was shot by police, the Home Office says. A passport stamp apparently giving him indefinite leave to remain "was not in use" on that date, added officials. 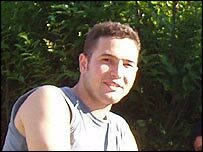 Mr Menezes, 27, was shot at Stockwell Tube station by officers wrongly suspecting him of being linked to the London bombings. His body has been returned to Brazil to be buried in his home town of Gonzaga in the south-east. Home Office officials said they wished to end speculation over his immigration status but added it was not intended to influence any investigations. Scotland Yard has admitted he was not connected to the attacks and Metropolitan Police chief Sir Ian Blair has apologised to Mr Menezes' family. On Thursday the Home Office said it wished to repeat the government's "deep regret at his tragic death". The department's statement said Mr Menezes arrived in the UK on 13 March 2002 and was granted entry for six months as a visitor. He applied for leave to remain as a student, which was approved and he was granted leave to remain until 30 June 2003. "We have no record of any further application or correspondence from Mr Menezes. "We have seen a copy of Mr Menezes' passport containing a stamp apparently giving him indefinite leave to remain in the UK. "On investigation, this stamp was not one that was in use by the Immigration and Nationality Directorate on the date given." The statement added: "This information is not intended in any way to prejudice or influence the independent investigation into the circumstances of Mr De Menezes' death, or any possible future proceedings." 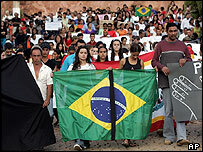 Officials said the information has been passed to the Brazilian government so his family could be informed. Mr Menezes will be buried on Friday. Meanwhile a major police operation is under way on the UK's transport system, with officers on a precautionary high alert to reassure the public and deter would-be attackers. In other developments, nine men have been held by anti-terror police in Tooting, south London, following raids on two addresses on Thursday. It is not thought that any of the suspected bombers is among them. On Wednesday night three women were held in Stockwell, a few miles away, on suspicion of harbouring offenders. Police are continuing to question 21 July suspect Yasin Hassan Omar following his arrest in Birmingham, as the search for the other three suspects goes on. The 24-year-old who is suspected of the attempted bombing of a Victoria Line train, near Warren Street, is being questioned at London's high-security Paddington Green police station.